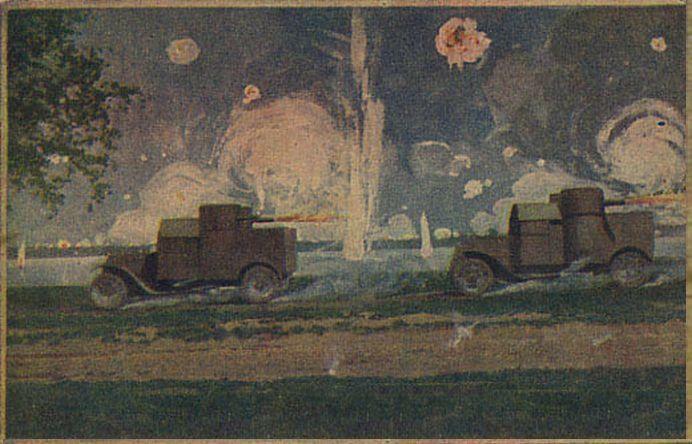 Reference post # 721 which is a photograph showing 2 Austin Armoured Cars 1st Series in combat, and here is an unknown artist's rendition of that battle involving the Austin Armoured Cars, entitled ' Galizien 1915 '. Below the painting, is the orginal photograph. 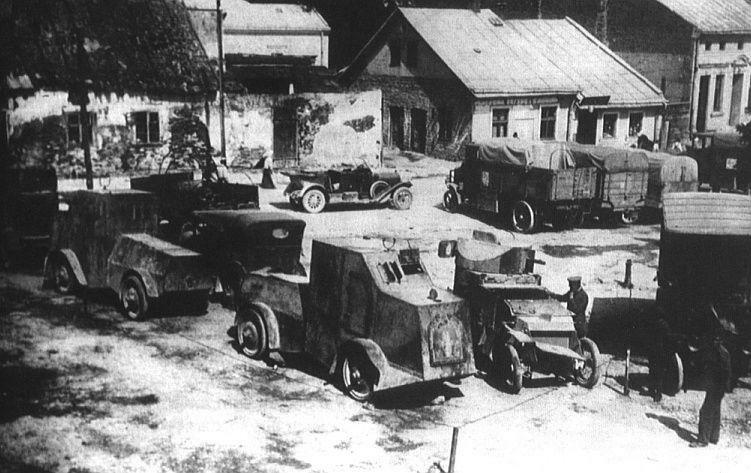 German photograph showing captured Russian vehicles including 2 Poplavko-Jeffery Armoured Cars, and to their right a Lanchester Armoured Car. 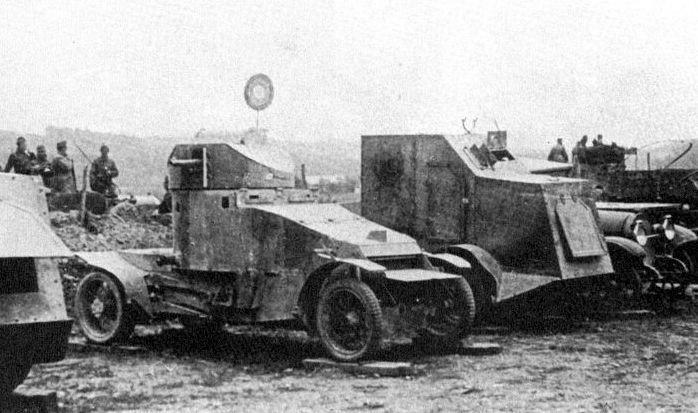 Interesting photograph of a Lanchester Armoured Car, to the right of the Lanchester is a Russian Poplavko-Jeffery Armoured Car, so again this is probably a German photograph taken of captured Russian vehicles, with someone being photographed with their head popping up from the Lanchester ? As the Lanchester is on wooden blocks, it was probably under repair at the time. 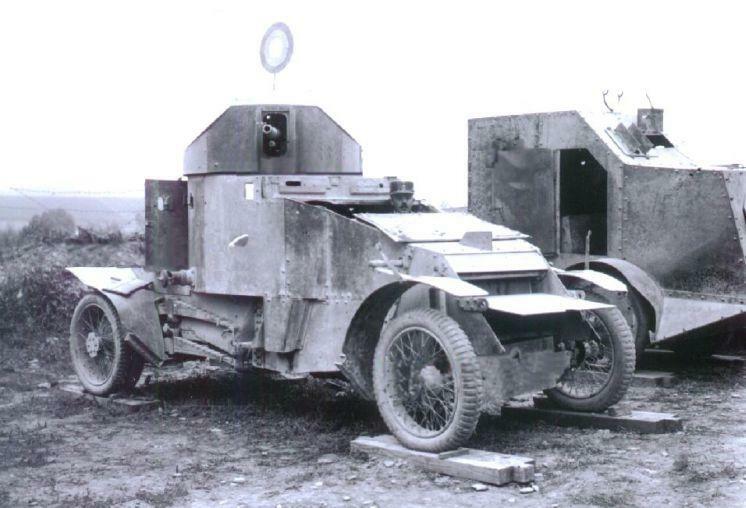 Same Lanchester Armoured Car as in previous post # 753, taken at a different time and from a different angle. Period photographs of a group of Lanchester Armoured Cars are somewhat scarce, and here is a nice photograph of 3 Lanchester Armoured Cars of the RNAS ( Royal Naval Air Service ) parked somewhere ? As these are ' Naval ' vehicles, are they said to be in their ' berth ', ' Shed ', ' Garage ' and are the serial numbers shown on the side and rear of the Lanchester's their ' Identification Numbers ' or their ' Call Signs " i.e. 6 A 2 - 6 B 3 - 6 A 4, as shown. Also, note the vehicle on the left, has single rear wheels. I have no information on this photograph and would appreciate members input. 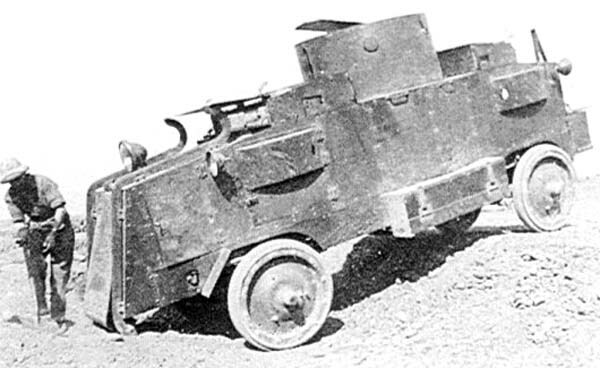 Another interesting Lanchester Armoured Car photograph, which again needs further identification. The landscape shown in the photograph looks arid, so it could be Gallipoli, Salonika or a desert region ? 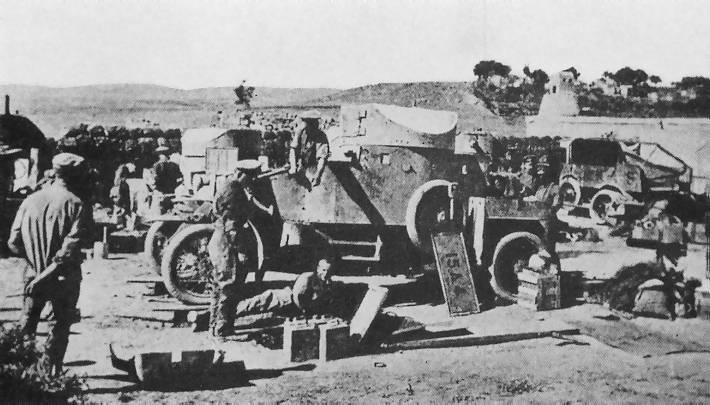 British soldiers, appear to be working on the Lanchester and another behind it ? The plate which appears to show the Lanchester's I/D or Call Sign ' 15 A 4 ' is leaning against the vehicle ? Again, members input would be appreciated. The Germans inspect a disabled Lanchester Armoured Car, off a French road. Thanks for the response, yes the photograph has the look of a London Depot, and there appears to be an oil pan under the rear of the Lanchester on the right ' 6 A 4 ', so probably a RNAS garage and maintenance depot. I shall take a look at that book, as it is not one I have. With reference to post # 755, RobL's suggestion that the Lanchesters were photographed at the RNAS Base at Wormwood Scrubs, which seems most likely. With regard to post # 756, the Lanchesters being worked on, whilst their being photographed in Russia is a good option, does anyone have any other suggested locations based on the evidence in that photograph ? Also, any ideas on the serial numbers on the Lanchesters rear plates, are they vehicle I/Ds, Call Signs or something else ? 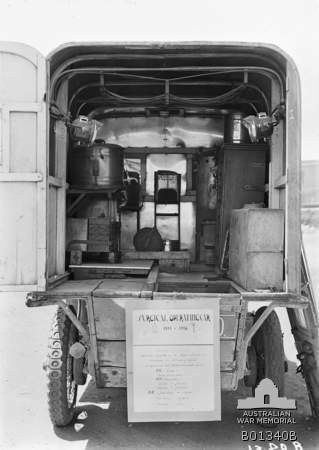 British Jeffery ' Quad ' Armoured Car. 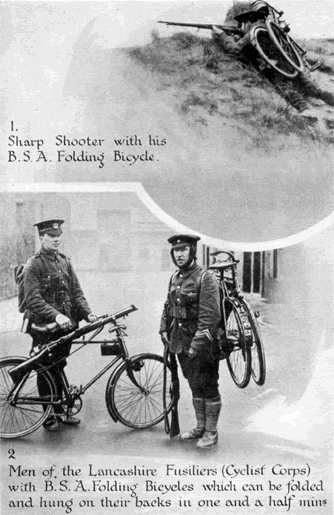 Pedal Power - Lancashire Fusiliers Cyclist Corps with the Army's new ' BSA ' Folding Bicycles. 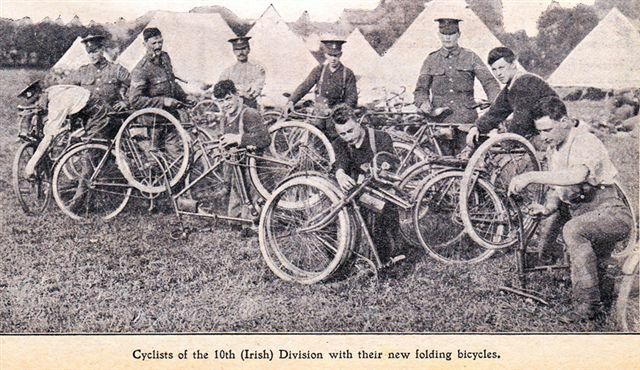 Cyclists of the 10th ( Irish ) Division with their new Folding Bicycles. The Lanchesters also saw service in both Persia and Turkey, and looking at the landscape in that photograph, those countries are also a possible location. Two great British motorcycles adapted for service use, a Norton motorcycle ambulance combination, and a Royal Enfield machinegun combination. 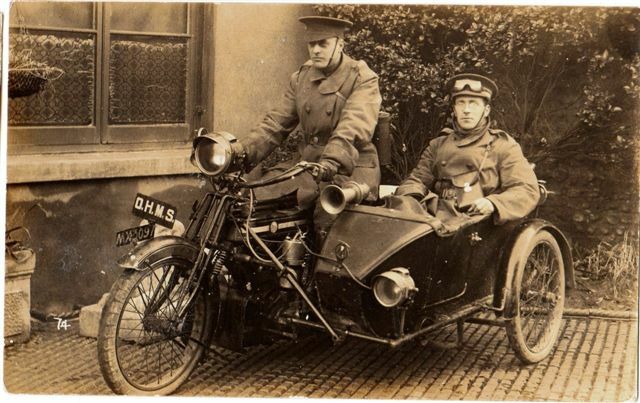 Army Dispatch Riders motorcycle and sidecar combination. 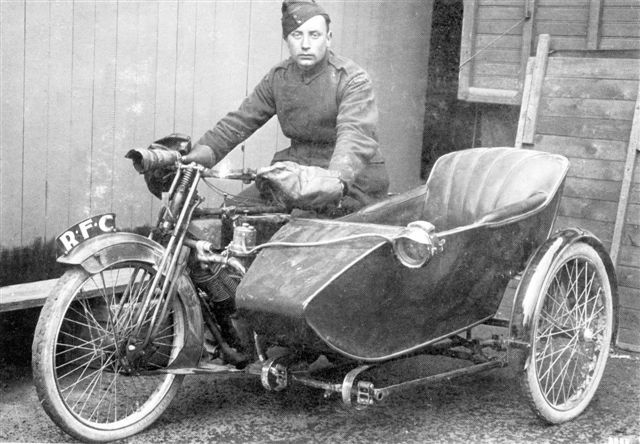 RFC motorcyclist, with RFC motorcycle and sidecar combination from the 29th Squadron based at Poperinghe aerodrome, photo dated 21.5.1917. Posible this was owned by rider? AA badge on sidecar. I saw the AA badge, and had it not been for the ' O.H.M.S ' plate, I may have thought it was a privately owned combination. 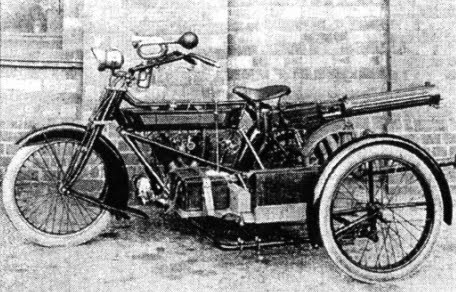 However, this added official ' O.H.M.S ' plate, the addition of the large spot-light on the side-car ( see the same type of spot-light on the side-car of the RFC combination ), and the large klaxon fitted on the side-car, all show this may have been a civilian motorcycle combination subsequently converted and transferred into military service. Here is another photograph of a unit of RFC Dispatch Riders, including 2 motorcycle/side-car combinations, and you will see on both the motorcycle combinations ( much clearer on the far right machine ) the cable coming from the motorcycle and draped over the top front of the side-car bonnet attached to the large spot-light fitted to the side-car, which was probably an additional item of military equipment not previously on that side-car. 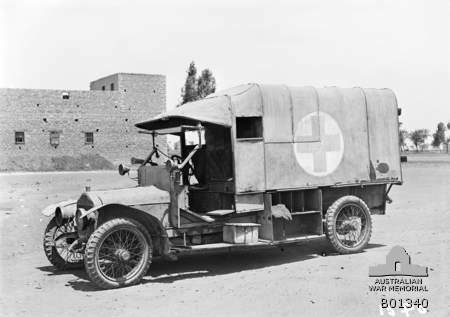 We know there was a drastic shortage of vehicles urgently needed for military use, and all sorts of vans, trucks, lorries, buses and motorcycles were transferred from civilian use to military use to meet that shortfall, hence some civilian features may still be seen on military vehicles which were previously civilian owned. The fitting of the lights look like a quick fix! The sidecar combinations appear to be right hand drive?